Last December, portraits of 12 remarkable female academic leaders were unveiled at the Royal Irish Academy (RIA) in Dublin — the first time ever in its 230-year history that portraits of women appeared on its walls. This was a milestone moment for Women on Walls, a campaign by Accenture in partnership with the academy, which seeks to make women leaders more visible and inspire the next generation – particularly in the areas of science, technology, engineering and maths (STEM). Eithne Harley , director of integrated marketing at Accenture, was in Academy House for a meeting to discuss new ways to attract more young girls and women into STEM careers when something struck her. “Where are the women?” she said while surveying the many portraits of leaders in sciences and humanities in the building’s halls and corridors. 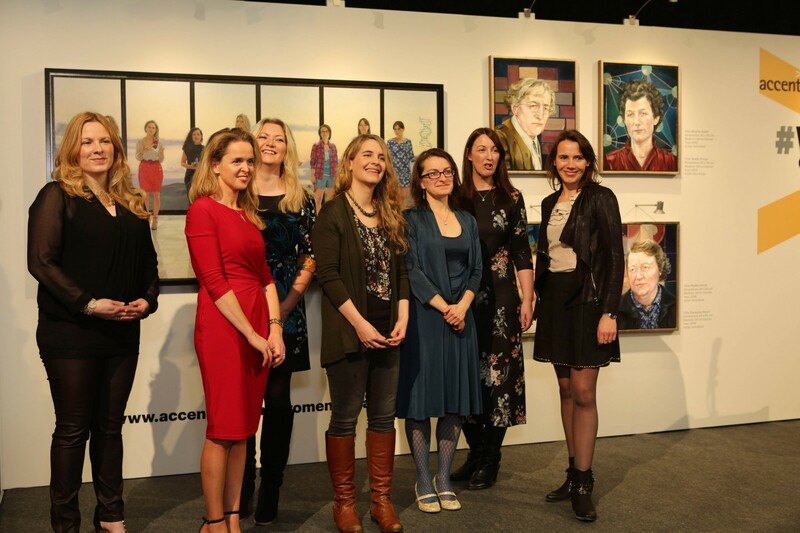 The decision was made to commission five paintings – individual portraits of the first four female members of the Royal Irish Academy, elected in 1949, and a group portrait of eight female scientists, who are recipients of the European Research Council Starter Grants 2012 – 2015 (see image captions for more detail). Women on Walls is the winner of the Best Large Sponsorship Award at the Allianz Business to Arts Awards – and it is easy to see why. It is a simple idea that has made a much bigger impact than originally anticipated, helping to drive new conversations on gender equality and inspiring others to follow its lead. On 9 March this year, 110,000 people tuned in to watch an RTE documentary exploring the significance of the campaign and following the artists at work. The hashtag #WomenonWalls trended No 1 on Twitter, achieving a reach of 763,000 on the night. In June, Harley was part of a panel discussion at the Body & Soul festival with Pauric Dempsey, head of communications and public relations, RIA and Professor Lydia Lynch of Trinity College Dublin and Harvard Medical School. The two commissioned artists for Women on Walls, Vera Klute and Blaise Smith, took part in a panel discussion during an Accenture event for International Women’s Day last March attended by 1,500 people. The open and transparent commissioning process was a particularly impressive aspect of this arts and business collaboration. Firstly, it involved an open call on 1 March, 2016, inviting Irish artists and artists based in Ireland for three years or more to submit previous work for consideration by a panel of local experts. By the deadline of 20 April, 55 submissions had been received. Art writer and curator Catherine Marshall, Kathleen James-Chakraborty, professor of art history at University College Dublin, Andrew Hetherington, chief executive of Business to Arts and Alaistair Blair, country managing director, Accenture Ireland, formed the judging panel. It was quickly apparent that there were two artists the committee liked. “There was some discussion about the opportunity to profile women artists, but the result was actually a blessing in terms of diversity. Accenture is always behind the idea of women and men coming together to promote equality,” notes Cullen. while Smith was the artist chosen to complete the group portrait. “What came out in Vera’s submission was her desire to tell a story not adequately told before and make it more visible to future generations – as well as her interest in learning about the work of the four women leaders,” explains Cullen. “To have your portrait painted means you have arrived and are part of the establishment. The women we selected have made it but were forgotten about. In Blaise’s submission he talked about what a wonderful and different challenge it would be to paint portraits of young people for a change,” adds Dempsey. The eight women to be featured in the group portrait come from disparate backgrounds. Smith consulted with his subjects on how they would like to be seen. The biggest challenge for Klute was that none of her sitters were alive. Accenture is also the winner of the Judges’ Special Recognition Award for Portfolio of Investment in the Allianz Business to Arts Awards for Women on Walls, its ‘Accent on Arts’ programme and support of the GAZE International LGBT Film Festival Dublin since 2012. “We incorporate art into a wide range of activities and events through Accent on Arts,” says Cullen. “We have commissioned new visual art for The Dock [our new offices in Dublin] with The Project Twins and James Earley and had concert pianist Maire Carroll playing at our International Women’s Day event this year. Accenture also promotes the arts within the company. It has its own in-house choir, Accenturephonics, as well as a musical theatre society and it is a patron of the Dublin Theatre Festival. “We recognize the ability of art to connect people, reach different audiences and bring about a change in thinking,” says Cullen.